Niagara and Oshawa met twice during the regular season. The IceDogs visited the Generals on November 18th, in which they came back to erase a 3-1 deficit, only to fall 4-3 in overtime. The November 18th game was the last before acquiring Jason Robertson and Jacob Paquette in the November 20th blockbuster trade. These two teams met a month later, when Oshawa visited Niagara, in the final game before the holiday break. The IceDogs were victorious by a score of 6-2 while wearing the specialty “Ugly Christmas” sweaters. Less than three weeks following this game, former Generals Jack Studnicka and Matt Brassard became IceDogs, after being acquired on January 9th. 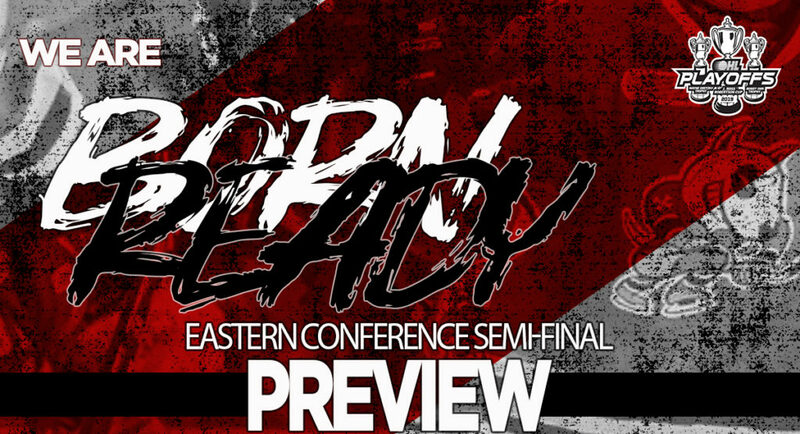 Game one of this series will be the first game Studnicka and Brassard play against their former team. In the two games, Vegas Golden Knights prospect Ben Jones scored 4 goals, and 2019 NHL Draft eligible prospect Philip Tomasino scored 3 goals, and picked up 3 assists. Drew Hunter and Elijah Roberts were the highest scoring defensemen for the IceDogs, each collecting 1 assist. Giovanni Vallati led the Generals with 4 points (2G, 2A) in two games, while Allan McShane scored a goal, and picked up an assist. In the playoffs, special teams play a significant part of a teams success. Over the course of the regular season, the IceDogs’ power play came to life with the additions of Jason Robertson, Jack Studnicka and Matt Brassard. To end the season, Niagara’s power play was ranked 2nd with a 28.1% efficiency rating. Entering the second round of the post-season, Niagara has the 5th best power play, with 26.9% efficiency. Niagara’s penalty kill became much more effective from the start of the season, finishing with an efficiency rating of 77.1%. After 5 games, the IceDogs are tied for 1st with a perfect penalty kill, not allowing a goal on 16 opportunities. Niagara has one shorthanded goal for. Over the course of the regular season, Oshawa’s penalty kill was effective 81.9% of the time. 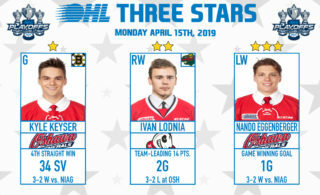 In five games this post-season, the Generals have allowed 3 goals while on the penalty kill, and have scored 1 shorthanded goal, making their penalty kill efficient 84.2% in 19 opportunities. The Generals’ power play had a 24.5% efficiency rating in the regular season, and was efficient 23.8% of the time in the playoffs. The matchup between the pipes, as always, will be key to our success. It is expected that it will become a battle between the starting net-minders, Stephen Dhillon and Kyle Keyser. Dhillon, who finished the season with 40-11-7-0 record, had a 2.97 GAA, and a 0.909 save percentage, in 58 games. In the playoffs, Stephen ranks 1st amongst all OHL goaltenders after five games these playoffs, with a 1.41 goals against average, .943 save percentage. Dhillon has recorded 3 shut-outs in five games. Meanwhile, Keyser finished with a 2.75 goals against average and a 0.915 save percentage in 47 games played, and a record of 32-8-3-0. In five games against Peterborough, Keyser has a goals against average of 1.81 and a .948 save percentage. The goaltenders will be tested strongly by each teams’ leading scorers. Three IceDogs finished in the leagues’ top 10 in total points this season, each with over 100 this season. After being acquired from Kingston, Jason Robertson finished the season with a career-best 48 goals, 69 assists (117 points). Robertson became the first IceDogs player to be awarded the Eddie Powers Memorial Trophy as the top scorer in the OHL, and in the CHL. Meanwhile, Akil Thomas (38 goals, 64 assists) and Ben Jones (41 goals, 61 assists) finished with 102 points (22G, 59A). Jack Studnicka set a career high of 83 points this season, with 36 goals, 47 assists, finishing 17th in league scoring, In 30 games with the IceDogs, the same amount as he played with Oshawa, Studnicka had 15 more points. Oshawa is led on the scoresheet by Brandon Saigeon, who had 92 points on the season, but had 29 points in 28 games with the Generals. Anthony Salinitri finished the season 88 points, while Serron Noel finished with 81 and Brett Neumann finished with 79. 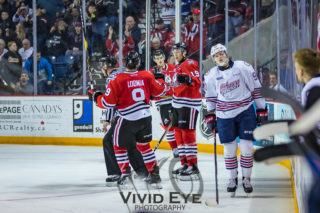 Heading down the stretch into the post-season, the IceDogs finished with an 8-2-0-0 record in their last 10 games, while the Generals finished with a 7-3-0-0 record in theirs. Playoff tickets are now on sale! 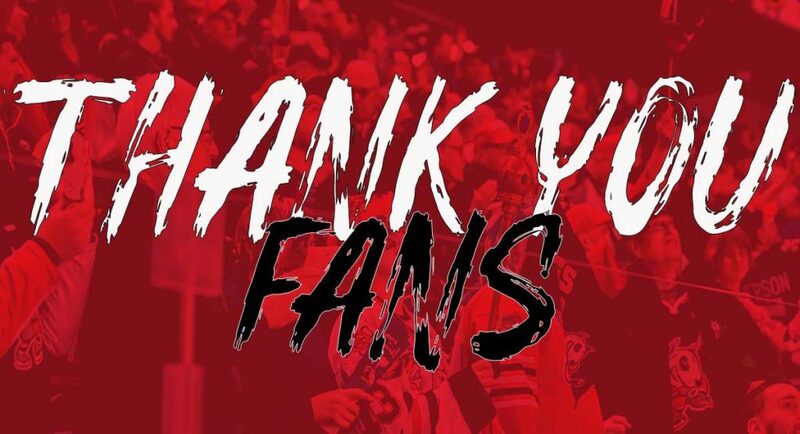 To get your tickets for our 2019 Eastern Conference Semi-Final series against the Oshawa Generals, visit our Business Office, Pen Centre or Seaway Mall Customer Service, Meridian Centre Box Office, call 1-905-687-3641, or click here! 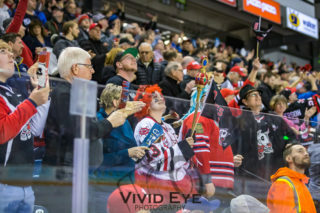 We are organizing fan buses to Oshawa for games 3 & 4! Click here for more details or contact Brianne to reserve your spot!